The Sign Studio has an extensive selection of high quality signage at great prices. 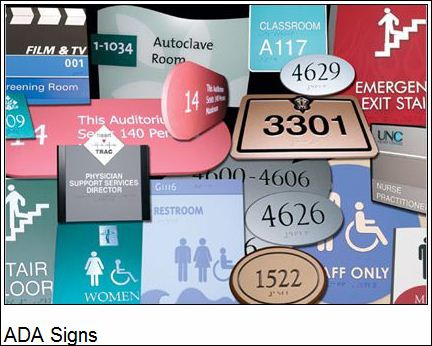 Whether you need ADA, Braille, handicap, or restroom signs, The Sign Studio can meet your needs. The Sign Studio is really a one stop sign company from concept to finish. From the moment you walk in, the person answering your questions and taking your order is also the person who will be working on your project, which minimalizes the risk of time consuming and costly mistakes. They can handle some of the trickiest installations you can throw at them and are fully licensed and insured. For over 20 years, The Sign Studio has been the place for custom graphics and logos. All work is done in house and they have a friendly and experienced staff that is capable of handling all aspects of your sign project including design, manufacturing, install, or repair.